Is this gorgeous or what!!!! 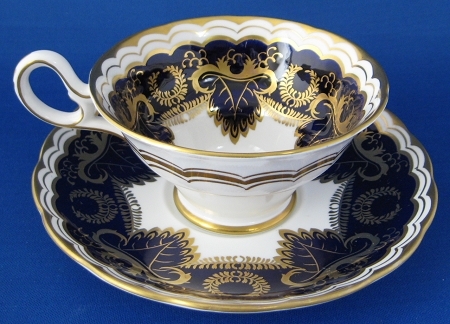 I just added this Grosvenor cabinet cup and saucer to Antiques And Teacups. I just LOVE it! Why cabinet, you ask???? Because it was so beautiful and well made it spent most of it's life in a china cabinet. A show off piece for sure. The color is a deep cobalt blue and white and all the gold overlay and gold trim is hand painted with burnished gold rims and cup foot. Really outstanding! The teacup is also slightly over sized which makes for an even more satisfying cuppa. Sunny on the Olympic Peninsula in Sequim today...bit coolish and turning leaves. One of the days I am so blessed to be living here. Get out and enjoy the autumn colors....unless you are in southern California which is having a heat wave....if so stay in & stay cool! This is the coolest shaped saucer for a cup and saucer. Very unusual! It's not flat or slightly concave, it has a raised central pedestal. How cool is that! 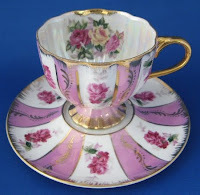 I acquired this with an estate lot of cups and saucers and fell in love with it!. The pink panels have a hand painted gold overlay and the white panels have a floral motif and all of the cup ans saucer has a luster finish and lots of gold trim. The saucer has the Lefton China, Japan mark as well as most of the original foil sticker. It was obviously treasured and was hardly ever used. I LOVE it! Was just in Utah to visit our kids and grandkids (both families) which was so cool. Had a great afternoon at the Museum Of Ancient Life at Thanksgiving Point. Had a great museum experience...one of the best paleontology museums I've seen. And we had a 3D movie which was fun. There was a lot more to see there but we'll save that for another visit. Our dtr has just moved to a new house near Snowbird and is at 6,500 feet. It was lovely to see the quaking aspens in their fall color. We're back in Sequim, Washington now...it's been raining today but has been gorgeous with sunny fall days for the last several. Just like it was when we first arrived to find our new home. We LOVE it when it's like this! Clear fresh ocean air. I best at the coast! Have a great week and stop and savor the sights and sounds of autumn, they are a delight for all the senses! Okay...you probably know about lawn bowling and probably billiards or curling, but do you know about carpet bowling??? During the Victorian age, parlor games and things for families were an important part of family life. 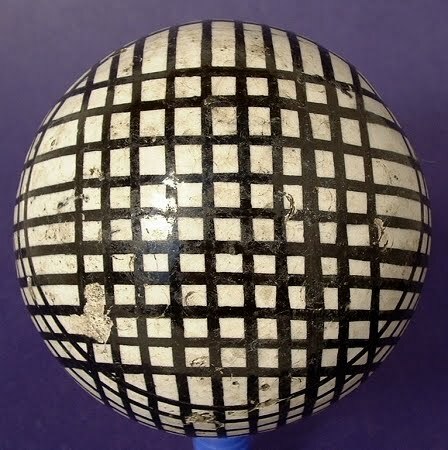 The game of Carpet Bowls using carpet balls was developed to move an outdoor game inside. England isn't THAT green without a reason...think mist, rain, downpour,....you get the idea. Carpet balls are really a forgotten Victorian fad. The balls are about 3 inches in diameter and came in a set of 6-8 with a smaller "jack" ball, usually white. The balls were made of fired clay and were decorated beautifully. There were plaids, florals, stars, stripes and other patterns. Original carpet balls or bowls (as in bowling) are very difficult to find and spawned a decorating frenzy about 15 years ago with Chinese made ones grouped together in bowls as decorative centerpieces. How fun! 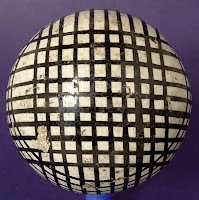 The heighth of popularity of the carpet ball was 1870-1890s and thousands were made, but few have survived. They were wacked, and cracked and generally abused. The ones I have at Antiques And Teacups show little concoidal hit marks and an occasional chip. But that just makes them have more character! Lovely day today on the Olympic Peninsula, but obviously fall...already! We're supposed to have and early, wet and cold winter... Joy. Have a great day!